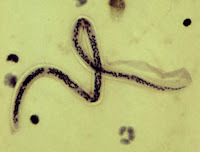 Also known as Lymphatic Filariasis, elephantiasis is a rare disorder of the lymphatic system caused by parasitic filarian worms such as Wuchereria bancrofti, Brugia malayi and B. timori, all of which are transmitted by mosquitoes. 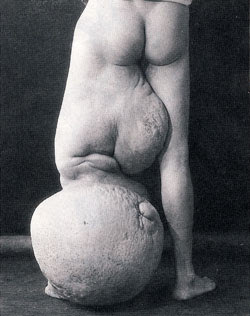 Elephantiasis occurs most commonly in tropical regions and particularly in parts of Africa. It is characterised by the gross enlargement of a limb or areas of the trunk or head. There is abnormal accumulation of watery fluid in the tissues, causing severe swelling. The skin usually appears thickened and pebbly, and may become ulcerated and darkened. Fever, chills and a general feeling of ill health may also be present. The swelling is a result of obstruction of the lymph flow and possibly of blood circulation. The lymphatic system blockage can be due to the recurrent attacks of a bacterial infection which causes inflammation of the lymphatic vessels.